The greatest all-round cricketer that ever was and may ever be. As a tribute on his 80th birthday we invited his team-mates, opponents and observers to share their memories of Garry Sobers. Bottom line: he was a genius like no other (and loads of fun too). A lot of people thought of Sobers as a natural who just played the game and did not think a hell of a lot about what he did. But he was very thoughtful. In fact, once, Mosman, the club in Sydney, was looking for a coach and the president had dinner with him and said, "Garry, we would love to have you as a coach, but you haven't got the qualifications." Garry said to him: "What did you think I got my knighthood for?" He helped me a lot with my batting when I was an 18-year-old kid. I said to him, "I've obviously got a bit of a problem here, Garry. Have you got any suggestions?" He said, "Go get a bottle of beer, son. And I will talk to you." He told me three things in those very early days and I did them for the rest of my career and they were a big help. He told me to take a leg-stump guard instead of middle, because I got back and across, same as him. He said also because I went back and across, I'd be better off batting just a little bit out of the crease instead of batting one foot either side of the crease. I don't remember the third thing now, but it was helpful. "Garry, we would love to have you as a coach, but you haven't got the qualifications." Garry said: "What did you think I got my knighthood for?" There is another great story. They were playing in England and Geoff Boycott came to him one day and said, "Garry, you seem to get me out lbw a lot. I don't understand it." Garry was quite good psychologically as well. He said to Boycott, "Unlike a lot of people, Geoffrey, I don't think your technique is that good." That would have cut Boycott to the quick because he prided himself on his technique. "Your front foot is too far across. You can't get your bat around your pad and my inswinger gets you lbw. That's what is happening." They go out on the field next day. Boycott is batting. Sobers runs up, bowls the first ball, angles it across, Boycott edges, gets caught at slip. As he is walking off, Sobey says to him, "Geoffrey, you didn't ask me about the other one." Of course I remember Sobers in the field of play as the greatest cricketer who ever lived - batting touched by imagination beyond textbook; bowling full of creativity, fast or swing or slow or chinaman; fielding the quick-silverest of all men close to the wicket. An unmatchable life force, all eyes turning to him in action, the unforgettable privilege of seeing him. But I remember him also as an overflowing fountain of life in the marrow of his being. Seizing the moment, burnishing it in the fire of his youth. 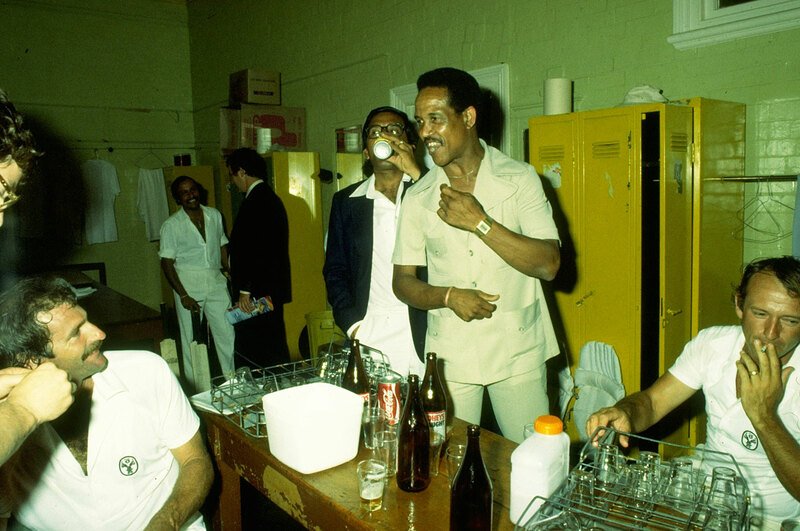 At a party with Sobers one night in the middle of a Test match at Bourda - the party seemed to have come to an end at about 3am at a friend's home. Back to the hotel now. But Sobers was restless. Someone mentioned a recently opened nightspot. "Man, nobody going to tell me a place call The Crimson Cabbage and I never pay a visit! It have a little time, le' we go take a little look!" Well, I suppose there was indeed a little time left before start of play. Life's net practice also is important. Someone can look it up, Sobers scored a big century later that day, flashing boundaries off side, on side, overhead, elsewhere not of this mortal world. When playing for South Australia, who had never won the Sheffield Shield, there was a player meeting before their final match. How to bowl at so-and-so? "Leave him to me," came a West Indian voice from the corner. How to play certain bowlers? "No worries, man, I get plenty of runs." Like any good pro, he obliged with a huge score, the wickets of key upper-order batsmen, oh, and a handful of catches too. "No worries, man. Leave it to me!" I played against Sobey quite a bit in county cricket. One occasion, where Worcestershire were playing Nottinghamshire, he picked one ball and hit it down the fielder's throat at deep-backward square leg. When we came together as a group at the fall of his wicket, Basil D'Oliveira said to us, "I'll bet you when Sobey goes past the guy that caught him on the way to the pavilion he will say, 'I didn't see you down there, maan.'" We asked the fielder and he confirmed that was exactly what Sobey said to him. He had such confidence in himself always that he was struggling with the fact that he could get out. When he first came to England he did not feel the need to use the thigh pad. He used to say, "What do you have your bat for?" But after being hit in the thigh a fair number of times with the ball nipping nicely into his legs in English conditions, he put it on. 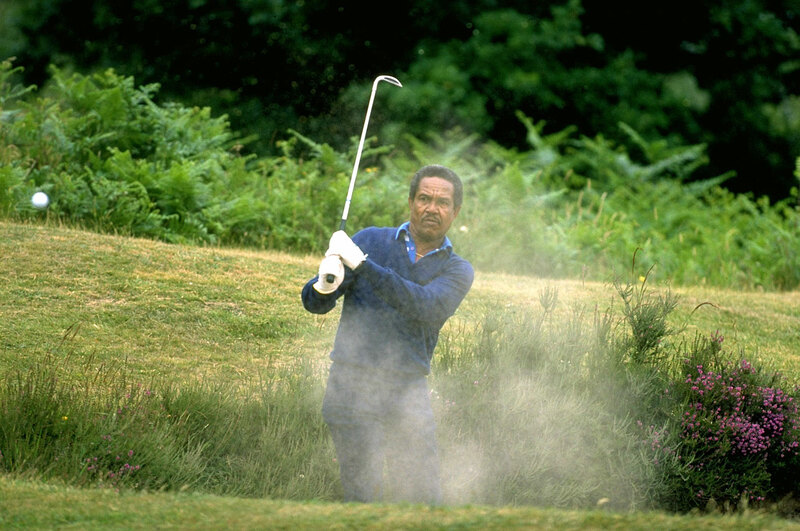 We know that Garry Sobers could do anything on the field and even off it. But these little quirky stories point out the man was just like one of us, except he could do great deeds. 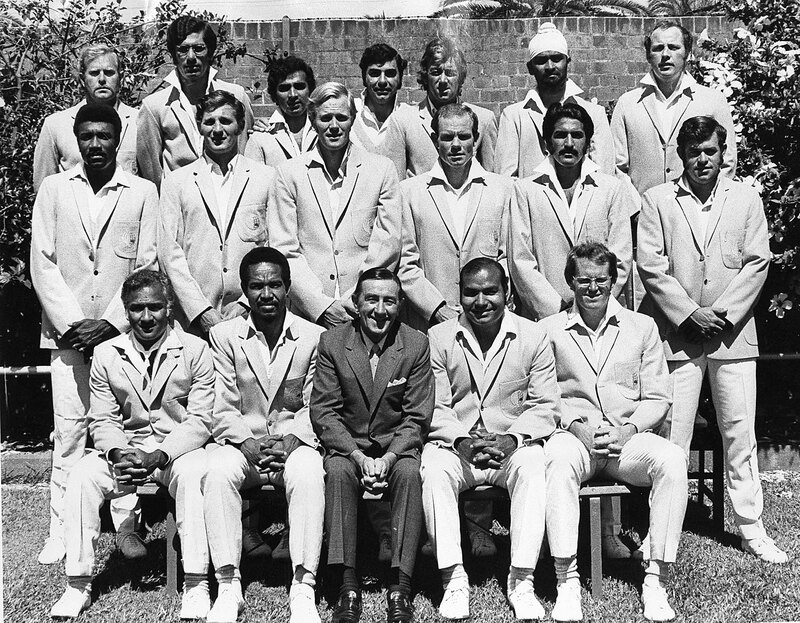 The 1960-61 series had two wonderful captains: Frank Worrell and Richie Benaud, both of whom were prepared to play cricket for cricket's sake. In that West Indies side were Rohan Kanhai, Conrad Hunte, the great Wes Hall and an emerging bloke called Lance Gibbs. But the bloke who stood out above all of them was a fellow called Sobers. Garfield Sobers. The bloke could do just about anything on a cricket field except umpire. He was a complete cricketer, magnificent fielder, bowled all types of bowling, and when in form, he absolutely decimated great bowling attacks. You could not set a field to him because he just had that innate ability to be able to score runs whenever he wanted to. In the tied Test in Brisbane he scored a century where he just bisected the field and it was absolutely one of the greatest innings I have ever seen in my life. He didn't just beat the field. He split the field. His placement was just incredible. In the second dig I just thought I would try something a little bit different. I eventually got him with a yorker. In the previous overs I'd bowled slow at him, varying my pace before I delivered the fast yorker, and it got through him. My emotions got the better of me; I was over-elated, because he was such a dominant batsman. When he was in form, a lot of bowlers used to give up on him. If he is hitting your best ball for a four then you know he is going to massacre you. It is a fresh memory still. Sobey was lurking at backward short-leg when I was facing Intikhab Alam at the MCG against the World XI. Inti was a pretty clever legspinner. He bowled a wrong'un to me. I thought it was a topspinner and it went sharply off the inside edge. In those days you were more likely to find someone at backward short-leg off a spinner than these days. Sobey was right in my hip pocket. It was a sharp chance. He just plucked it with his left hand, a one-handed catch low to the ground. In the same match, he massacred the Australians with his 254. There are two lasting memories. One was Sobey square-driving a yorker from Dennis Lillee. It was a ball that should have challenged Sobey really, but he ended up driving it and the ball bounced back about 15 metres off the fence at point. Then Bob Massie with the second new ball. He bowled a late in-dipper. Sobey was preparing to let it go, but at the last minute with a flick of the wrist hit it between myself and Terry Jenner at mid-on and midwicket for a four. It was an incredible reflex response to what was a pretty good ball. He just had those incredible wrists. We were once playing a game of golf at the Victoria Club in Melbourne. The first hole was a downhill par four. Sobey hit a 1-iron onto the green, which was just unheard of. He had that tremendous natural talent. It was at the MCG in the Australians v World XI game. Dennis Lillee had walked in to bat at No. 11. Garry told me, "Rookie, just go back a couple of steps further. I'm going to show him what fast bowling is all about." He bowled him a few bouncers in a row and next ball got a wicket. Lillee was running for cover every delivery. When we went back to the dressing room, he told Garry, "I look forward to seeing you out in the middle." Sobers said he was waiting too. He ended up scoring 254. Garry always loved a fight. I remember, once I was batting with Clive Lloyd for Lancashire against Nottinghamshire, where Garry was playing. If I recollect correctly we used to get a bonus point when the team total got to 200. Clive and myself were hitting the old ball easily. The new ball was taken and Garry came on to bowl. We just needed one further run to get the bonus point. Garry bowled six of the most beautiful left-arm outswingers. Clive was batting, I think, in the 70s. He tried to drive, did not get a touch on a single ball. South Australia were playing Victoria in February 1964 at the Adelaide Oval. I was talking to Victoria's wicketkeeper Ray Jordon the day before the match. It was a terribly hot day. We were having a beer. Slug, as we called Jordon, said to me, "Eh, Jar. You know what?" I said, "What?" He said, "Nah, nah. I'm not going to say it." I challenged him: "You a Victorian or a mouse?" Slug then said, "All right, I think Sobers is overrated." Somehow Sobey found out what Slug had said. Victoria elected to bat, but we knocked 'em over for 101. Sobey got three wickets. Then he went in and made 124 and came out and got six more wickets as South Australia secured an innings-and-46-runs victory inside three days. So Sobey beat Victoria all by himself. From then on I'd say to Jordon, "Hey, Slug" and he would just walk away, saying, "Just leave me alone." And guess what, they docked us one day's pay for winning early! There is an interesting related story. Bill Lawry, Victoria's captain, was once making a speech at a public function. During the question time someone asked Lawry what he thought of South Australia, who had just won the Shield. "They are a one-man team," Lawry said. Rosemary, South Australian batsman John Lill's wife, stood up and asked Lawry: "Excuse me, Mr Lawry. Am I to believe one West Indian is better than 11 Victorians?" I have a story from when I was a child. He was visiting Trinidad and came to our primary school. I must have been seven or eight. Right outside the school was a small park (near the Aranjuez Savannah) and there were nets, and the whole school assembled to watch him, and I was standing there pressed up against the chain-link wire fence and a ball came my way and hit me in the belly. And all I could think was that I had been hit in the belly by Garfield Sobers. It was November 1963. I was making a return to the state side, South Australia. 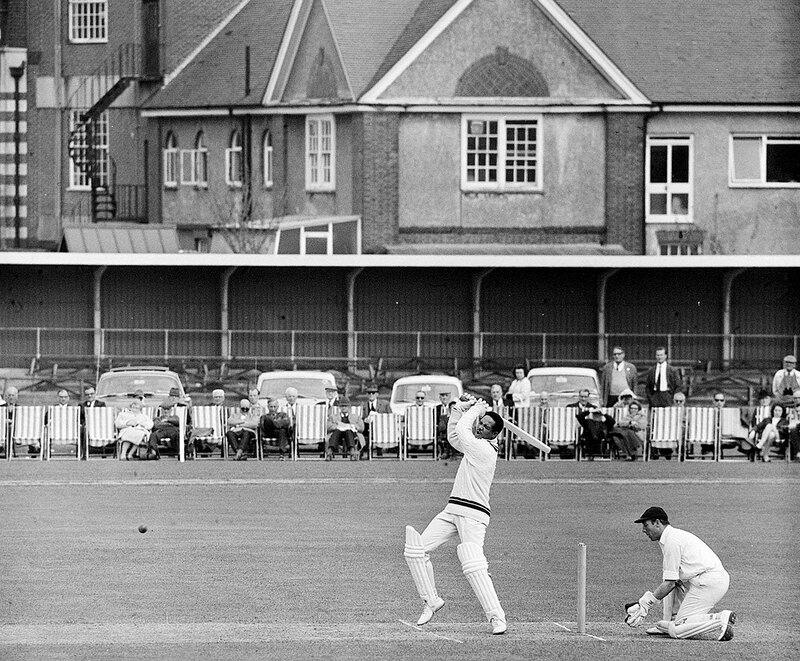 We went to Victoria and I had got a couple of wickets when Colin Guest came in to bat. After two balls, Garry put up his hand and signalled to me that he had moved just about a metre from the hip of Guest, whom he had observed playing some awkward glances round to the leg side. I bowled a ball the other way and Guest played the same shot, and Garry took the catch virtually off the bat. Later that season we were playing Queensland at the Gabba. To Ken Mackay, the Queensland captain, a left-handed batsman, I had been going wide of the return crease, bowling outside his off stump to try and get an angle to hit the off stump. Mackay was tending to let go balls that were not going to hit the stumps, and those that were, he seemed to drive easily. Garry came to me during the change of overs and said, "Look, why don't you bowl from closer to the stumps? Try and hit his leg stump by bowling inside that off stump and see if you can get one through his bat and pad." You can probably guess what happened: that is exactly what happened. He was very astute. He turned up at Nottingham for the first time - 1968. The players hardly saw him till practice the day before the first Gillette Cup match [against Lancashire]. He was captain. It was cold and he came down the steps of the pavilion, wandered over to the nets wrapped tight in a sheepskin coat. He shook hands with everyone, watched for ten minutes, then left. Next morning he arrived an hour before the game. Changed, put on a couple of jumpers, stretched and went out to toss. "We're bowling, fellas," he said. He took three for not many. Then they got into trouble chasing a low score, about 50 for 3 chasing 170-odd. He strolled out against the best seam attack in the country - Higgs, Statham, Shuttleworth, Lever and Wood - and made 75 not out. Notts won with ten overs to spare. After he received the Man-of-the-Match award, he came into the dressing room and said, "Well played all you fellas, now who we got in de next round?" Mike Taylor says they all just gawped at him in awe. Garry Sobers and Ajit Wadekar went out to toss the coin in Port-of-Spain in the 1971 [second] Test match. There were no match referees back then. Up went the toss. There was a gentleman by the name of Ken Laughlin who went close to the square and faced the crowd and hit his chest to indicate West Indies had won the toss. He always used to do that, as he was a bit of a personality. 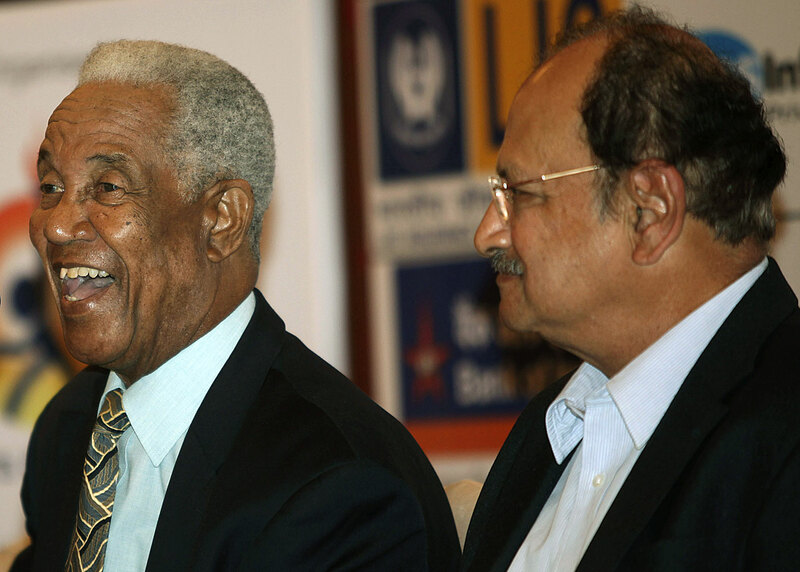 Sobers turns to Wadekar and says, "Ajit, I'll let you know what I'm doing." Ajit tells him, "No, Garry, I won the toss. I'll tell you." Sobers, the gentleman that he was, did not want to make a big issue and told Wadekar they should go up to the dressing room. He conceded to Wadekar eventually, and West Indies ended up losing the match. So it was a good toss for India to win, so to speak. As a batsman, Sobers was not all attacking and dominating. In Port-of-Spain against England in 1967-68, the match seemed to be heading for a boring draw. Having elected to bat England had made 568. West Indies were forced to follow-on after making 363. They had to bat the whole final day. They seemed to be going strong till around the tea break. Suddenly West Indies were eight down for 180. Sobers was joined by Wesley Hall. There was still a whole session to go. The men were involved in this very tense, nail-biting partnership. All you had to come was Lance Gibbs, who was not known for his skills as a batsman. But Sobers was able to jockey the bowling, take as much of the strike as possible, especially during the early part of the partnership. At this stage [David] Brown and [Jeff] Jones were bowling short and hostile from round the wicket and over the wicket. The game ended in a draw with Sobers unbeaten on 33 - probably one of the slowest innings of his life. Hall came in not out on 26. At the end of the day Hall told the journalists, "Well, I wouldn't have worried about myself. I was just worried about the young man at the other end - would he have lasted?" He evoked instant great, great laughter. After he had hit six sixes at St Helen's in Swansea we went into the bar, where Garry was pinned into a corner by the Glamorgan committee members. All of them wanted to talk about the six sixes, but Garry did not want all that. He was not that sort of person. He told us players, "Come on, lads, let us go back to the old tavern." Garry Sobers was not interested in world records, he was just interested in playing. He did not want to make too much of a fuss about the record. He wanted to keep it simple. That to me is the greatness of the man. He is such a likeable guy. In 1970, in the first Test at Lord's between Rest of the World and England, he was our captain. He was just so natural. Sobey played out of his skin: he scored 180-odd and took so many wickets [eight]. I knew him from county cricket, but just to see him play like that against the best in the world, as England were then, he was unbelievable. He got wickets with seam, with spin. In the end we won. And the best part came when at the end he just said, "Okay guys, see you at Trent Bridge." It was like nothing had happened. At The Oval, in the final Test, on a turning pitch we needed about 20 runs chasing 200-plus . I was privileged to join him at the end. He was again so natural, dealing with the bowling on a very, very difficult wicket. He did not exaggerate his shots, just played them, knocked off the winning runs and away he went. His attitude was unbelievable.